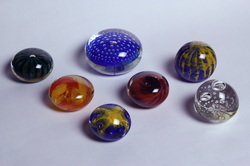 In this workshop you will learn how to make a variety of paperweights. You will also become familiar with basic hot shop procedures and safety practices. Each participant will successfully make a number of paperweights. Refreshments and a light lunch are supplied on the day.